HUDDERSFIELD have handed a trial to former Saints and Bradford goalkicking winger Jamie Foster. The 25-year-old, who has played rugby union since leaving the Bulls at the end of the 2014 season, will have his first training session with the Giants today (Monday) in a bid to secure a contract with the club. Foster, who scored 902 points in 88 Super League appearances including the 2011 Grand Final for his home-town club Saints, can also play full-back. 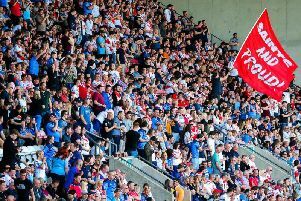 Huddersfield, who have money to spend following the sale of England second rower Brett Ferres to Leeds, are urgently looking to strengthen after losing Scott Grix, Joe Wardle, Danny Brough, Kyle Wood and Luke Robinson and Craig Huby to injury.